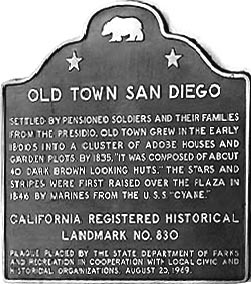 Old Town San Diego State Historic Park, as well as the local Old Town Community, is the site of many California Historical Landmarks. California Historical Landmarks are buildings, sites, features, or events that are of statewide significance and have anthropological, cultural, military, political, architectural, economic, scientific or technical, religious, experimental, or other historical value. The following Landmarks are within the State Historic Park and are a great overview of the rich history of early California! Also click over to California State Parks Office of Historic Preservation.